Overview: Do you remember Him? That’s Him with an uppercase H, as in a proper name. He first appeared many moons ago in Fantastic Four #67, then was brought back for four issues in Thor. He’s an interesting guy but he needs a better name. How does Warlock sound? Even better, let’s make it Adam Warlock. This is Essential Warlock Vol. 1! Warlock has been found by the High Evolutionary, who takes in Warlock as a new project. Embedding the Soul Gem in his forehead, Warlock is sent to Alternate-Earth (which is located on the far side of the sun from Earth in the same orbit) to become a hero for a heroless world. Warlock befriends a group of teenagers trying to find their way in the world, and that way eventually leads the group to the White House. There we find that the President is actually the Man-Beast in disguise, who is looking to take over the world. Warlock tries to stop the Man-Beast but it can’t be done before the cancellation bug brings his book to an end. So the final battle takes place over in the pages of the Incredible Hulk. The green giant finds himself on the Alternate-Earth and encounters Warlock being held prisoner by the Man-Beast. Warlock makes the ultimate sacrifice – his own life – to stop the Man-Beast but is resurrected a few days later in a new, more powerful form. When Warlock returns to his own title, after a quick run in Strange Tales, he starts to find a new set of friends, as well as new enemies. Now traveling the galaxy, he meets Gamora and Pip the Troll, who end up tagging along on his adventures. He also meets Magus, a would-be god in the future who just happens to be Warlock. Our hero must destroy his future self in order to save the universe of today. Now, this collection would not be complete without mentioning Thanos, the big bad heavy of the Marvel Universe. Warlock and Thanos have been linked together for a long time, and it starts with the issues in this collection. Thanos finds that he must work with Warlock to defeat Magus’ army, but once that battle is done, they go their separate ways. Thanos hatches a new plan to rule the universe, and it takes the combined efforts of Warlock and his crew, along with Spider-Man, the Thing, Captain Mar-Vel, and the Avengers to stop Thanos for good — for now at least. What makes this Essential? : This collection makes for an interesting look at religion. With the initial arc from Roy Thomas and Gil Kane, the writer was inspired by the then-current Jesus Christ Superstar musical. Sharing a name with the first man in the Bible, Adam Warlock is sent to Earth (albeit Alternate-Earth) to help save the people from a false prophet. 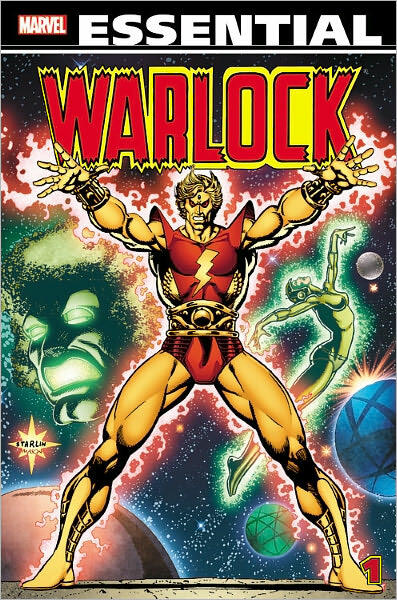 During the Jim Starlin arc, Warlock must battle a future version of himself who has been set up as a god across the universe. Given the teases for Warlock in both Guardians of the Galaxy movies, I anticipate the demand for this book to increase as he joins the Marvel Cinematic Universe. 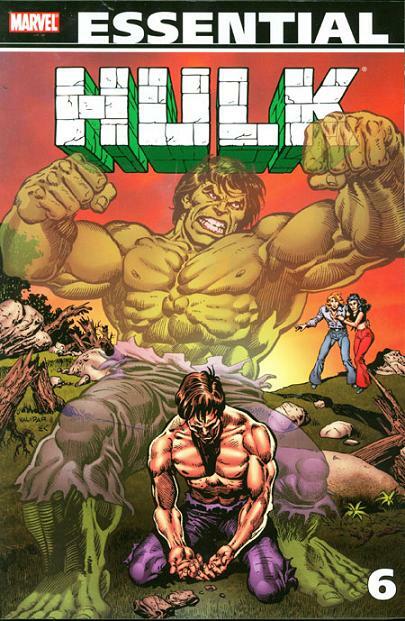 Footnotes: Incredible Hulk #176 to #178 were also reprinted in Essential Hulk Vol. 5. Marvel Team-Up #55 was also reprinted in Essential Marvel Team-Up Vol. 3. Avengers Annual #7 was also reprinted in Essential Avengers Vol. 8. Marvel Two-in-One Annual #2 was also reprinted in Essential Marvel Two-in-One Vol. 2 and Essential Avengers Vol. 8. If you like this volume, try: The Infinity Gauntlet mini-series from 1991. Written by Jim Starlin with art by George Perez and Ron Lim, Thanos has acquired all six infinity gems and mounted them onto his glove. Seeking to win the affection of Death, Thanos kills half of the galaxy, including the Fantastic Four and the X-Men. The remaining heroes are given a chance to stop Thanos, but they are unable to prevail. Transcending into a god-like being, Thanos leaves his body unprotected, and his reported granddaughter Nebula steals the glove and restores the universe to how it was before. When things have settled, the recently returned Warlock takes possession of the glove, which led into a new ongoing series titled Warlock and the Infinity Watch. Overview: Welcome back to the fifth Essential Iron Man volume from Marvel Comics, in which our hero, Tony Stark, finally adds the one accessory to his suit that it really didn’t need – an iron nose! This volume has several storylines that run across multiple issues at a time. Iron Man battles Doctor Spectrum from the Squadron Sinister at the Stark Industries plant in Detroit, which leads to a battle against his fellow Avenger Thor. During this battle, Happy Hogan is injured while trying to cover for Tony, and the treatment to heal him reverts Happy back to his Freak personality. That story no sooner wraps up before Iron Man is off to southeast Asia, where he gets caught-up in a super-villain royal rumble, as the Black Lama is setting up villains to fight each other for supremacy. Enter the Yellow Claw, the Mandarin, the Unicorn, Man-Bull, Whiplash, the Melter, and others. This complex storyline, plagued by the dreaded deadline, wraps with Iron Man and Firebrand following the Black Lama to his home dimension for one last showdown. The best part of this story arc was issue #72, which found Tony grounded in San Diego for repairs, and makes a visit to the 1974 San Diego Comic Convention. One of the minor highlights of this volume occurs around issue #73 when Stark Industries undergoes a name change to Stark International. Tony wanted to showcase the diversity of all business aspects that the company was involved in, and he wanted to put some distance between the munitions manufacturer that his company was once branded as. What makes this Essential? : I really was not that impressed with this volume. Some decent stories, but these are not great stories. You read this volume only if you are a die-hard fan of Iron Man. But my guess is that if you are that die-hard fan of Iron Man, you might be better off owning the original issues. Some checking of online retailers shows that most of these issues are very affordable despite being 40 years old. Footnotes: Iron Man #76 is a reprint issue of Iron Man #9. The cover for #76 is included in this Essential. 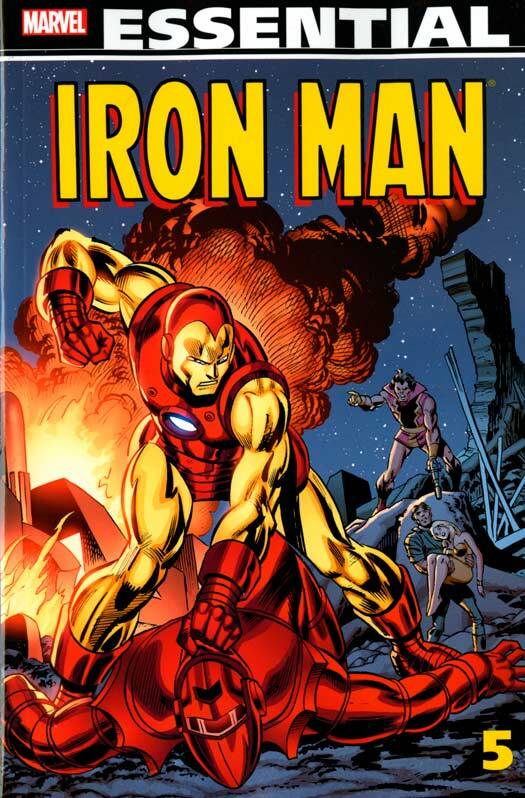 Issue #9 was collected in Essential Iron Man Vol. 2. Iron Man Annuals (King-Size Specials) #1 & #2 and Giant-Size Iron Man #1 were all reprints of various stories from Tales of Suspense. The covers to those issues are included in this Essential. If you like this volume, try: Iron Man: Armor Wars from the 1980s. Written by David Michelinie and Bob Layton, with art Layton, Mark Bright, and Barry Windsor-Smith, this has been collected numerous times in trade paperbacks and hardcovers. Tony Stark discovers that some of the technology used in his suits – technology that is so secret he dares not patent it – is now being used in the suits of numerous super-villains. Tony goes on an armor hunt to track down his missing technology, while at the same time updating his own armor to stay ahead of the competition. This story arc would be repeated multiple times in multiple formats, such as in comics as well as the Saturday-morning cartoon series from the 1990s. Overview: Ghost Rider is back in action with another Essential volume reprinting his original series from the early 1980s. 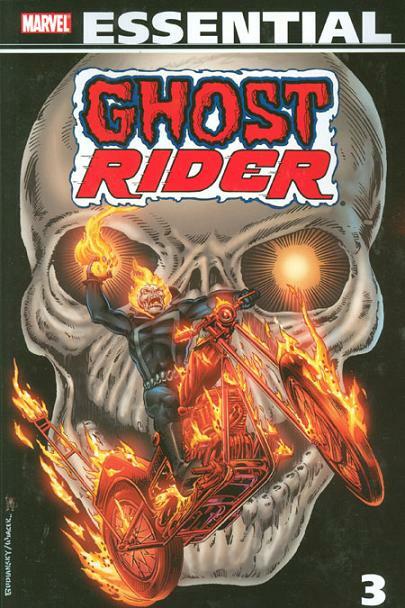 Stunt rider Johnny Blaze travels the American West, going from one gig to the next, doing his best to stay out of trouble as well as keeping the demon Zarathos from taking control of his soul. Without a lot of supporting characters from issue to issue, many of these stories are one-and-done as Ghost Rider finds himself in a different location each issue. It’s not to say that Johnny doesn’t run into some familiar faces along the way. We get crossovers with the Thing, the Avengers, the Arabian Knight, Werewolf by Night, and others. What makes this Essential? : I’m sure there is something I am missing here, but I just don’t get Ghost Rider. I understand the origins of the character. I can see how some people would be attracted to this character. But from what I have read so far in these Essential volumes, I find it disappointing. The stories and the art seem very average. I have read more contemporary Ghost Rider stories and found them much more interesting. My only thought is that these Ghost Rider issues filled a niche in the market and the followers were extremely loyal and vocal to keep Ghost Rider around. Footnotes: Marvel Two-In-One #80 is also reprinted in Essential Marvel Two-in-One Vol. 4. If you like this volume, try: the original Marvel mini-series, Marvel Super Heroes Contest of Champions. This was originally planned on an oversized special to coincide with the 1980 Summer Olympics. But when the United States pulled out of the games, Marvel shelved the project and resurrected it two years later as a three issue mini-series. In Contest of Champions, the Grandmaster engages in a game against the entity representing Death. He wants to get his brother, the Collector, resurrected, and wages his own life if he should lose. The two participants choose teams of heroes from around the globe and make them square off against each other. While Ghost Rider is not featured in this series, the Arabian Knight and the Thing are both participants in the game. This series has been reprinted multiple times, making it easy to track down in some format. Overview: Once again, we swing into the crazy life of Peter Parker, the Spectacular Spider-Man. We see Peter struggling with his relationship with the Black Cat, who only has feelings for him when he is in costume. There is the question of the Black Cat’s new powers – how she came to get them, and why they are driving her away from her Spider. All of this gets wrapped up in the anniversary issue #100, with an all-out battle between Spider-Man, the Black Cat, the Kingpin, and the Spot. Yes, the Spot! After that, we are given a lot of one-and-done stories to fill out this Essential. The title has a rotating creative team until Peter David and Rich Buckler take control of the book, creating some memorable storylines, detailed below. A benefit to these issues were some amazing covers by John Byrne for issues #101 and #102. There is one issue towards the end, #111, which was a Secret Wars II crossover. Spider-Man’s adversary, the Puma, decides that it is his life purpose to destroy the Beyonder, and Peter finds himself with the moral dilemma of saving someone like the Beyonder. What makes this Essential? : This book could be divided into two halves, one labeled Before Peter David, and the other Written By Peter David. The Before Peter David stories wrap up the ongoing storylines from Essential Peter Parker, the Spectacular Spider-Man Vol. 4, featuring the long-running story between Spider-Man, the Black Cat, and the Kingpin. The stories here are very similar in tone and quality to the other stories of this time (Amazing Spider-Man, Marvel Team-Up). There is a marked shift in tone when Peter David comes on board. These stories are his earliest work at Marvel, and they quickly show what an excellent writer he is of comics. The characters feel more real, more alive under David’s guidance. He shocked readers with the killing of long-time supporting character Jean DeWolff, not just proclaiming it on the first cover of the storyline, but with her dead body on page 3 of the story, giving no one the chance to say good-bye. For the work that David showed here, it is worthy of picking up. Footnotes: Peter David would bring back the Sin-Eater in a second storyline, which ran in The Spectacular Spider-Man #134 (January 1988) to #136 (March 1988). These three issues, along with the original four-issue storyline, were collected in a Marvel Premiere edition, Spider-Man: The Death of Jean DeWolff. If you like this volume, try: Spider-Man 2099 This was one of the first four titles in the Marvel 2099 line launched in 1992. Originally conceived as a Marvel: The World of Tomorrow project by Stan Lee and John Byrne, the concept eventually morphed into the 2099 line. 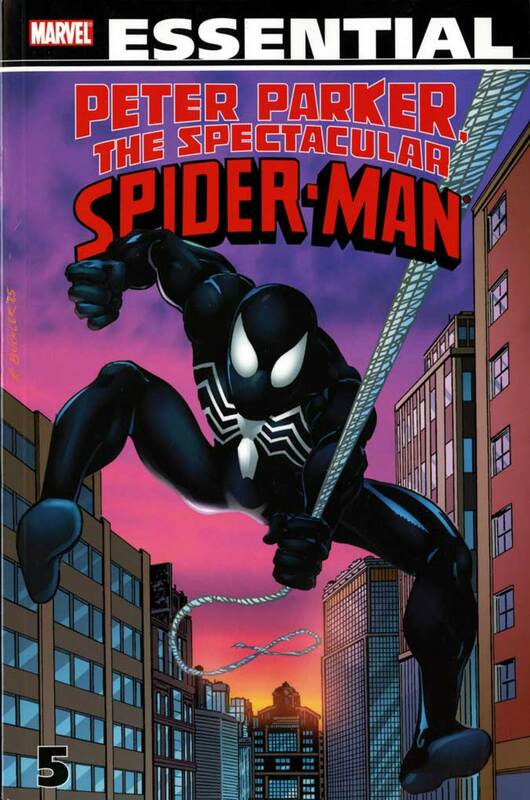 The Spider-Man title ran for 46 issues, plus two specials, with almost all of the issues written by Peter David. In this story-arc, Miguel O’Hara is trying to recreate the abilities of Spider-Man when a freak accident causes half of his DNA to be over-written by the DNA code of a spider. There have been two trade paperbacks collecting the first year of the title, but the entire series is worth tracking down in the back issue bins. Overview: He’s back! He’s mad! And he’s green! Do we need much more than that for an introduction to the sixth volume of Essential Hulk. There are two main names to know about this book – Len Wein and Sal Buscema. Both joined the series in the last volume, helping to provide the definitive take on the Hulk in the 1970s. At the end of this volume, Wein transitions the writing duties over to Roger Stern, who will begin a long run with our title hero. The basic points of the story remain the same. Bruce Banner changes to the Hulk when he is angered. The US Army led by General Ross is on the hunt for the Hulk. Banner still has feelings for Ross’ daughter Betty, who married the general’s second-in-command. The Hulk still has feelings for Jarella, the green queen of a microscopic world. Finally, the Hulk once had friends, such as Rick Jones and Jim Wilson. But at the end of the day, the Hulk is a loner. That’s everything you need to know to get started with a Hulk story. Now I mentioned Jarella earlier, the queen of her world. She reappears in the Hulk’s life, but this time by coming to his world. In the heat of a battle, Jarella is killed saving the life of a child. The Hulk does his best to save his love, going from one Doc (Samson) to another Doctor (Strange) but nothing can overcome death. Not even the Hulk. You could make the argument that Jack of Hearts makes his first comic book appearance (Incredible Hulk #213) in this collection. He had been a character featured in the Marvel black & white magazines up to this point. I guess I could promote this as Jack of Hearts first appearance in color, but we all know the Essentials are black & white collections. Maybe we should just be excited for the inclusion of Jack of Hearts for a few issues and go with that, OK? One of my favorite B-grade villains is introduced in this collection with the Constrictor. He wears a costumed suit with electrified adamantium alloy cables that shoot out of his wrists, creating a heavy-duty whip that he can use as an offensive weapon. He never sticks around for vey long, but I always loved the design of his costume. What makes this Essential? : I am unsure how to sum up this volume. The stories are interesting, and there are some memorable moments (particularly with Jarella) that stand out in this volume. Sal Buscema has become THE Hulk artist in this era, and visually defined who the Hulk is at a time when there were more eyes on the book as a result of the CBS TV show. But I find myself wanting just a little bit more from these comics. I get the feeling that monthly publishing schedule was more important than developing and pushing the characters forward. It’s OK to have books that meet the publishing schedule month after month, but for a book that has been around for more than 10 years (at this point), I just don’t know if we see the growth in the Hulk character compared to the growth seen in other characters in this time-period. This is a good volume, but I really want some more at this point with the Hulk. If you like this volume, try: reading up on Jack of Hearts. Visually he is so interesting to look at, although he probably induces nervous twitches in artists or colorists when his name comes up in the script. His appearance here in the Incredible Hulk is his first outside of his initial story arc in the Deadly Hands of Kung-Fu magazine. Born from a human father and an alien mother, Jack Hart discovers as he grows up that his body is developing deadly energy. His father designs a special containment suit, which just happens to maybe look like a Jack from a deck of cards. (This was the 1970s – inspiration could be found EVERYWHERE!) Over the years, Jack of Hearts would pop up in a variety of Marvel titles, sometimes embracing his cosmic heritage, other times just to provide a visually interesting character. He did land his own mini-series in the mid-1980s, but that has not been completely reprinted. He did eventually join up with the Avengers, during the Busiek and Johns eras in the late 1990s. Sadly, Jack of Hearts did not survive the roster upheaval with Avengers: Disassembled, and has been used very sparingly ever since. Overview: Welcome back to the Defenders, everyone’s favorite non-team in the Marvel Universe. No matching uniforms like the FF or New Mutants. No ID cards like the Avengers or Alpha Flight. No charter or official group headquarters for these heroes. Just a willingness to help out when called, or if you happen to have nothing else to do on a Tuesday night. This is an interesting collection of stories, as writer J.M DeMatteis uses the opportunity to have his stories here cross over into other books that he was writing at the time, such as Marvel Team-Up and Captain America. We also get the introduction of two new characters to the Defenders unofficial line-up. The first is a brand new character in Gargoyle, who was once Isaac Christians, a man in his late 80s. In an effort to save his declining Virginia town, Christians makes a deal with Avarrish to serve him. His first assignment is to slay Hellcat. Gargoyle eventually turns on Avarrish and sides with the Defenders in their battle against the Six-Fingered Hand. Unfortunately, Christians finds he is trapped permanently inside the body of the Gargoyle. With no place else to go, the Gargoyle joins the Defenders. Another familiar face makes his first appearance with this would-be team. Hank McCoy, a.k.a. the Beast finds himself working alongside our heroes. As a founding member of the X-Men and a one-time card-carrying member of the Avengers, the Beast is very much into the team dynamics, something this group of heroes is sorely lacking. But that story takes a little longer to develop, so stick around for Essential Defenders Vol. 6. What makes this Essential? : I really want to rate this higher. I think this title became more interesting in this era, as it featured less of the four core “non-members” (Doctor Strange, Hulk, Namor, and/or Silver Surfer) and more of the extended members (Valkyrie, Nighthawk, Hellcat, Gargoyle, and Beast). However, despite the change of focus, I didn’t find much about this collection that remained memorable. I read this a few years ago, but I honestly have no recollection of many of these stories. If that’s the case, I can’t honestly believe that this is essential. 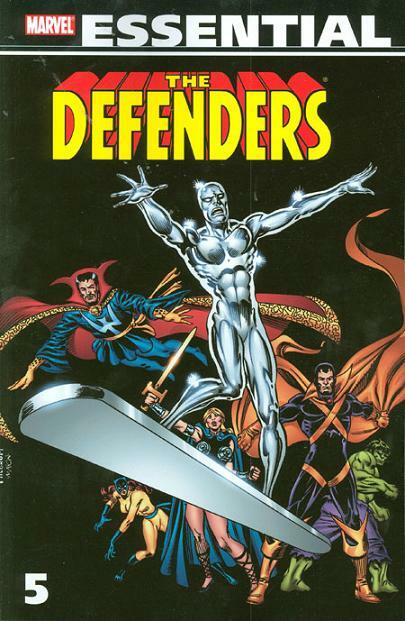 For the Defenders completist, I can justify having this in your collection – provided you didn’t already have the issues. But I just can’t give this a “go-out-and-buy” this book recommendation. If you like this volume, try: the Nighthawk mini-series from 1998. While it appears that Nighthawk perished in the explosion at the end of Defenders #106. Turns out he actually did survive, but he’s been in a hospital in a coma for many months. Nighthawk’s soul makes a deal to perform various tasks in order to fully return to the living. Unfortunately, the tasks come with ulterior motives, and Nighthawk must overcome his saviors in order to return to normal, thanks in part to the timely assist by Daredevil. This is just a three issue mini-series, written by Jim Krueger with art by Richard Case. It has never been reprinted, so you will need to dive into the back issue bins to track this one down. Overview: You remember the Martian invasion back in 2001, right? The Martians came to Earth, destroyed governments, and left the planet as a human-breeding farm to feed the growing Martian-population. Don’t worry though, in just two short years, a red-headed human will escape the slave pits to lead a revolution, to rid the Earth of Martians and reclaim the planet for the humans. Welcome to the future (or alternate) world of Killraven! In the early 1970s, Roy Thomas and Neal Adams collaborated to find a way to work H.G. Wells classic story, The War of the Worlds, into comic book form. Rather than do a direct adaption of the original story, they instead took the situation from the book and told a story based on the Martians successfully taking over the Earth. What would the Martians do once they occupied the Earth, and how would the humans respond. From there, the character of Killraven was developed. Originally designed to be a next generation version of Doc Savage, Killraven borrows heavily from other concepts – from Conan the Barbarian to Flash Gordon and more. Eventually, the band of freedom fighters find themselves in Florida at the Martian headquarters, and their Killraven finds his brother, who has betrayed his brethren and is working with the Martians directly. The rebels destroy the Martian base, crippling their hold on the humans, and Killraven parts ways with his brother in a final battle. But the battle is not over yet, and Killraven moves on to the next untold adventure to save the Earth. What makes this Essential? : This is an interesting story, in particular when we get the creative team of Don McGregor and P. Craig Russell. Those two were definitely in sync with the direction and the flow of the book. These are some of the most creative comics that came out of this era, when compared against many of the other Essential volumes from this era that I have read. BUT… in the grand scheme of the Marvel Universe, this seems to be an isolated aspect that doesn’t get revisited much. With the bulk of these stories taking place in the (then) future, and it later being determined that it was an alternate Earth’s future that faced the Martian invasion, there hasn’t been the demand/need to go back to this story. 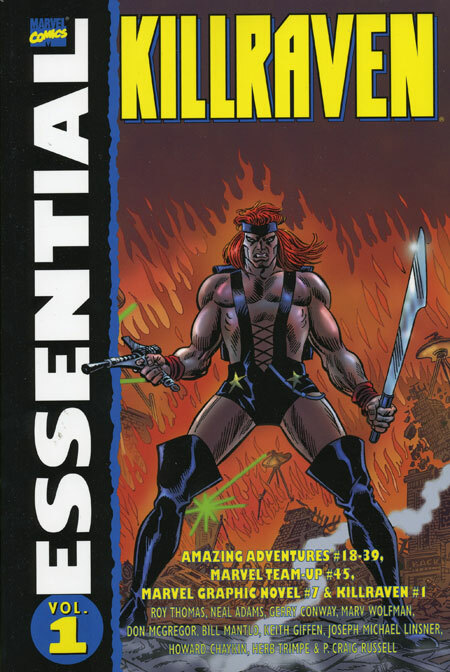 Killraven is occasionally brought in for the rare cameo appearance in other Marvel Universe titles, but I feel that is more to keep a copyright in place rather than to continue Killraven’s story. I think this is an important volume to have for the sci-fi/fantasy fan, but I can think of multiple Marvel Universe characters that probably deserved an Essential volume ahead of Killraven. Footnotes: Marvel Team-Up #45 is also reprinted in Essential Marvel Team-Up Vol. 2. If you like this volume, try: Weirdworld, the five-issue miniseries from Marvel earlier this year that tied in with the 2015 Secret Wars event. Written by Jason Aaron with art by Mike Del Mundo, this fantasy epic touched on so many familiar elements of the Marvel Universe from the 1970s and 1980s. Arkon, a long-time foe for the Avengers and the Fantastic Four, is struggling to find his home, Polemachus. Unfortunately, he is stuck traveling through the Weirdworld zone of Battleworld in order to find his home. Along the way, he encounters the likes of Warbow, Skull the Slayer, Jennifer Kale, and others. At the same time, he finds that Morgana Le Fay is working in the background to stop him. Del Mundo’s art is spectacular in this series, giving it a dream-like appearance from page to page. This has been one of my favorite comics from 2015, and I hope you got a chance to read it too.